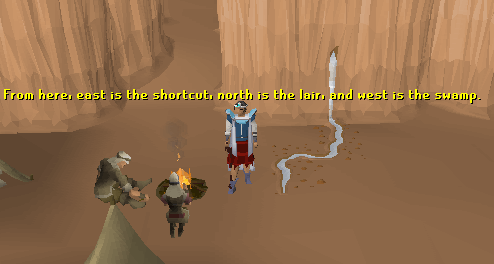 This is a little-known mini-quest that was added with the Dealing with Scabaras quest. It focuses on completing the research that you started during the quest for the archaeologists around the campfire. This is accomplished by collecting tidbits of information from the Scabaras and adding it to your journal supplied by the archaeologists. Speak to Abigail the archaeologist, located at the top of the plateau from which the Scabaras Lair is accessed. This Mini-quest is not for the faint of heart. It involves fighting in multicombat zones with all the monsters being above level 100. They use all three attack styles, and in any given area you will be fighting two of the three styles. You will also need to deal with disease, poison, and desert exhaustion. You will have to make a multitude of bank trips, and the reward will not balance your cost. You will lose money by doing this mini-quest, and you need to make a hefty time investment. Do not attempt unless you are bored, have cash to burn, or just want to be able to say you have done every Quest and Mini-quest. Rope: I highly suggest this, no matter which of the three methods you use. This is because there is a shortcut you can make between the agility pyramid and Abigail's camp. You can skip the swamp and jump right onto the Plateau from the west side of it. 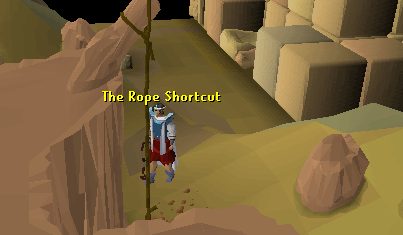 This shortcut can only be made from Abigail's camp side, so you must first walk through the long way before you can make the shortcut. To make it, first walk to Abigail's camp. Then walk west until you hit a low wall. Climb over it and avoid the mummies, while continuing to walk west for a short distance. You will see a rock hanging over the edge or the Plateau; use your rope with it. Then you are done, you my use that shortcut any time from either side and you do not need to bring a rope ever again. The rope will stay there forever once you set it up. 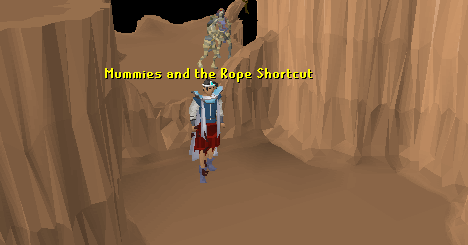 Pharaoh's Sceptre: This is something convenient to have in combination with the rope shortcut. 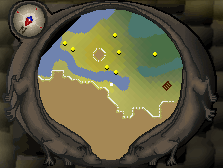 It will allow you to teleport to the Agility Pyramid (which is right next to the rope shortcut), and then back to the Pyramid Plunder Pyramid. This significantly cuts down on the time required for a bank run, and can be an emergency escape option if you find yourself trapped. I only ask that you consider saving it for an emergency; if you die, you might lose it. 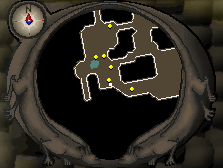 Additionally, it can be used to get to the Agility pyramid quickly in case you just died. I found out the hard way that it is impossible to get back to any part of the Plateau in 5 minutes if you do not have a Pharaoh's Scepter. Enchanted Water Tiara: If you are using method one or three for the Drop section, I suggest wearing this. Make sure it has at least 40 charges each time you leave the bank so you do not need to worry about water. This will save you a large amount of inventory space which can be used for food, potions, or drops. One Click, One Space Teleport: This is absolutely essential if you are using method two, and is a safety net for methods one and three. This is pretty self explanatory. For all three, wear the best armour that you would not mind losing. Something can go wrong at any point, and these Scabaras are not forgiving. At the swamp, I took 44 damage from multiple sources using multiple combat styles in one combat turn. Although it is not required, using prayer will limit how much food you need and what you wear. Since each area only has two combat sources at most, plan accordingly. Wear the best armour against one, and pray for protection from the other. Inventory: In terms of inventory, always bring your journal and leave one slot open; you may get lucky and get a 'Scabara Note' before eating one piece of food. If you are not praying, bring 26 high quality food items and the journal, simple as that. If you are praying, bring prayer pots on a 3:2 ratio with food. The prayer pots will be your main Defence, while the food will be in case of other sources of damage, such as dehydration, random events, or a second combat type source. To start this Mini-quest, talk to Abigail the archaeologist. She is located on the top of the Plateau from which the Scabaras Lair is accessed. 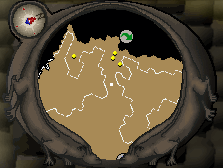 This is directly east of Sophanem. However, you must start this Mini-quest through the main quest Dealing With Scabaras. 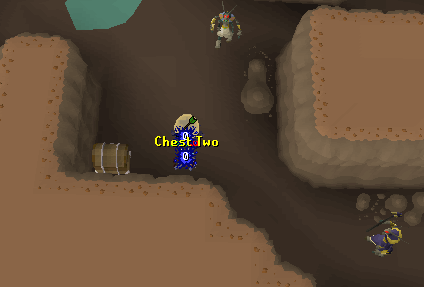 This Mini-quest is comprised of three steps: Quest, Drop, and Chest. You do not need to complete these in any specific order, but the book will not be considered complete by Abigail until it contains all the Notes and Thoughts from every step of the Mini-quest. 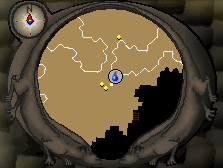 This section is the longest and most time consuming part of the mini-quest. You will get a total of 13 Notes for this step of the mini-quest. Keep track of how many you get! There is no indication of how close you are to finishing the journal, and the only way to see if it is complete is to talk to Abigail again. Lastly, be sure to immediately add the notes to your book as soon as you get them. It is possible to get the same Note as a drop twice if you do not add it to your book. You must kill Scabaras until you have collected 13 more 'Scabaras Notes'. 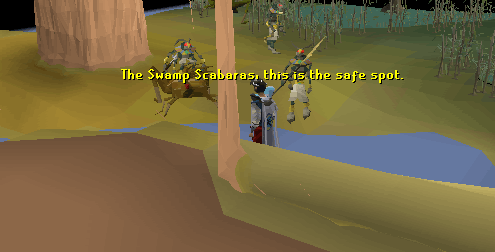 You may once again kill any Scabaras in the Scabaras Lair or in the swamp to the east of Abigail, but you have the added option to kill mummies. 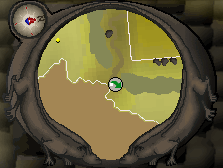 The mummies are located west of Abigail, along the shortcut path (detailed above). Each of these three options has its own positive and negative aspects, each of which has been summed up in the following outline. However, keep in mind, they all share the aspect that you will take large amounts of damage, and you will need to periodically restock. Swamp Scabaras are suggested. They are the most time consuming, but also the safest. You will use about the same amount of food over a longer period of time, but prayer can be easily used so that only a little food is needed. Also, you may run west and then north or south as a 'safe' spot in case of emergency. From northern spot you can range one Scabara lancer (or anything else that wanders there), but bring telegrab runes since the walk to collect drops is time consuming. 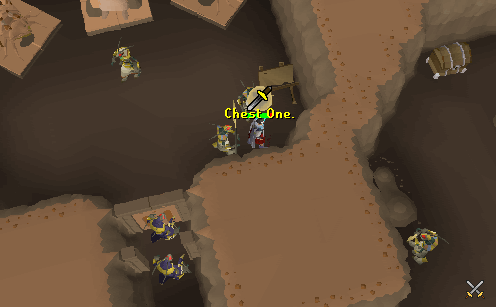 The last step of the Mini-quest is the Chest portion. To complete this section, you must venture back into the Scabaras Lair and find two chests hidden inside. Each of these chests contains one 'Scabaras Note' that will not be dropped by any Scabaras, not matter how many times you kill them. Simply click on the chest to obtain the Note contained inside. Located outside the room that the Scabaras High Priest is located, against the wall directly east of his position. 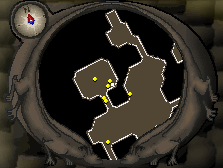 There are only a few Scabaras mages and rangers in this area, so it should not be too difficult. This one is more difficult. The chest is located in the south-west corner of the cave system, at the far end of the large room. This large room is filled with Scabaras mages and rangers, and each can hit into the low teens in the multicombat zone. I suggest going to Chest One with 'Protect from Magic' on, then run south. When you reach the large room, switch to 'Protect from Projectiles'. The chest should be in the south west corner of the most western room. Once you have both, run out. If you are about to die, click both quickly. If they are added to your book before you die, it will save your progress. Then simply go back to Abigail and she will give you your book back, complete with both Chest Notes. If you do not add then, you will have to get both Chest Notes again. This is a convenient way to check what your book is missing in case you lost count during the Mini-quest In addition, anyone who wishes to see the history of the Scabaras without doing the Mini Quest may read the entire collection here. 's notes: The archaeologists theorize that Sophanem was built by the refugees fleeing Ullek. The disaster that befell Ullek left in its wake a large number of undead creatures in the area. There is some debate between the two archaeologists as to whether these undead are the result of vile sorcery or simply the results of the use of this area as a graveyard. Initial findings seem to suggest that the area was once heavily forested, in stark contrast to its current desert state. Abigail seems convinced this is due to humans chopping down all the trees, but Kerner is of the opinion that trees regrow so quickly as to make deforestation impossible. (1) The Foresters are most incompetent of late. Their claims that sources of wood are becoming scarce smacks of laziness. I shall have them flogged if quotas are not fulfilled. The furnaces must remain lit. (2) Another setback. The deliveries of timber we were expecting have arrived, but are in the form on bank certificates. While we could burn them, I fear it will not be must use. For now, I will have them stored with the other certificates. (3) It appears if Elidinis has forsaken us. Armies, led by vile misbelievers, are smiting the northern settlements, Uzer is under siege and it cannot be long before we are also under assault. The outside areas may fall, but we should be secure in the tunnels beneath Ullek. (5) ...and infested with some sort of giant maggot. That's bad for both morale and health. I fear that this is simply a reflection of out current dire situation. I only pray we are not forced to starvation and the dire choices that would entail. (6) Icthlarin has not taken us, after all. Though many died in these stinking warrens, we few have survived. We will now travel to the village of Sophanem and hope there are other survivors there. I have vowed to pay for a temple to be built there, in honour of the deities who saved us... that is, if our currency is of any value in this new world order. (7) As Scabarite custom dictates, the outer gateways have been sealed. No disturbances will now occur and we may worship in peace. The fortuitous discovery or a large stock of ordure may even allow some of the less pious worshipers to breed. (8) The relaxation of breeding rules may have been something of a mistake. More of the young seem to believe that we should leave the darkness and seek to explore the outer areas, where odd noises have been heard. I shall pray for guidance, even though answers from Scabaras are clearly unlikely. (9) Although he did not reply directly, I have been seized by visions of some sort. A female with a red- sheened carapace and antennae spoke to me, sending disquiet through my soul. Could it really be that only the destruction of all other life will allow us the isolation we crave? (10) I am convinced. We will break through to the surface and ensure these noises are quieted. Silence shall be ours! Both the chasm and the outer areas are currently under investigation, by those dedicated enough to accept pollution of their souls for the greater good. (11) The chasm has proven to be a dead end to us, for the moment. The external trek has been useful, though. We discovered some large creatures, not wholly unlike us, with the capacity to leap great distances. Some have been captured for research. There were other creatures, too - dead but moving. Could this kind of existence provide the ultimate solitude? (12) A breakthrough, of sorts! The leaping creatures have enabled us to send warriors up through the chasm to explore. They report a large area of tunnels which they are now securing with traps. Traps that should be effective against the soft-skinned humans we can even now smell. (13) Contact! We have slain several human warriors, after emerging into the outer areas of a surface settlement. I am, however, worried that this contact might be sullying the forces. I have instructed that more traps be used so that pollution does not occur. (14) The red-tinged female reappeared and urged for a more active destruction of the surface-dwellers. The dreams come evermore and my mind is torn. She speaks for Scabaras and I shall follow, but I have not had such communication in years and the toll upon me is telling. Everything is blurring. (15) Now, I realize, there are two minds within me... and neither is strong enough. To be cursed so, with no chance to be alone, even within myself. I must control my thought... or should that be 'we'? (16) Paralyzed by indecision or firm in the face of adversity; aloof or apathetic; violent or strong; merciful or weak? There is no difference within me. What will be the ultimate fate? (17) The High Priest seems to be wandering in his mind, so we follow his last instruction as Scabaras would wish us to. The outsiders will be destroyed. We slew one in the upper chambers and set our largest guardian to guard the area where he was found- all too close to the chasm. (18) A setback. The scarab guardian we left by the chasm was slain! Although no penetration has been made into the nest via this route, we have increased the number of perimeter traps are are considering a full assault upon the settlement known as Sophanem. (19) We have heard reports of an intruder in the vaults before the doors- an area not fully set with traps! I have had visions of Scabaras in the guise of a female with red chitin. Now, I know what we must do: destroy everyone, for ultimate peace and solitude. 's notes: The High Priest of Scabaras has a view of the genesis of Scabaras that differs from my own. In his opinion, the three dreams giving rise to the other minor deities were ultimately unsatisfactory to Tumeken. Thus, on the fourth night of dreaming, Scabaras was brought into being, the most perfect of the deities and the most pleasing to Tumeken. The most important part of the cult precepts seems to be that solitude is the ideal circumstance for self-improvement and an untroubled existence. 's notes: Most orthodox teachings of Scabaras rely on the worshipper meditating in silence, with interaction frowned upon due to being likely to pollute the mind. The recent events have reinforced this view as far as the High Priest is concerned. The pollution of the Devourer's words led to the recent depredations of the Scabaras cult. Obviously, the Devourer was able to convince the High Priest that solitude could only be guaranteed by killing non-Scabarites. After turning away from the influence of the Devourer, it is, perhaps, quite flattering that he should chose to talk to me at all. 's notes: Although this pollution is now driven from the mind of the High Priest, the perversion of the Scabaras' teachings has driven many of the Scabarites permanently insane. Slaying them is thus an act of mercy in the opinion of the High Priest. In any case, these deranged beings will not be a threat to an but those who approach them. Sophanem is safe. 's notes: When I questioned the High Priest of Scabaras as to the origins of Scabarites, I gained few useful facts. Apparently, their physical form is a blessing for generations of loyal service to Scabaras. Many of them live in the dark places beneath the soil, though gatherings such as I have seen are very rare indeed.